The IBM 1410 and 7010 were designed as enhancements to the IBM 1401, these were somewhat source compatable, but not binary compatable. The 1410 was introduced on September, 12 1960 and the 7010 in 1962. The 1410 was withdrawn on March 30, 1970. The 7010 featured 4 I/O channels where the 1410 had 2. 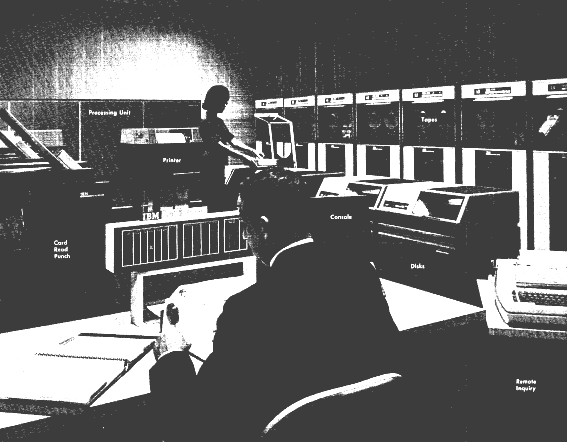 Also the 7010 could access 100,000 characters of memory as opposed to the 80,000 for the 1410. The 7010 also featured optional decimal floating point instructions. Memory was divided into feilds seperated by a special flag called a word mark. Instructions end at the first character with the word mark set. They consist of a operation code, followed by 1 or 2 5-digit addresses, and an optional instruction modifier. If the 10's and 100's digit have zone bits set the address is modified by the contents of the five characters at locations 25-100. Each register is 5 characters long and word marks are ignored. The 1410 and 7010 could also be optionaly equiped with priority mode to allow for device complete interupts. The 7010 or 1410 cpu has no registers. All operations on done from memory. Alot of software has been recovered for the 7010. If find anything else please contact me so arragements can be made to save the software and make it available to more poeple.